Is a double drive gantry type flying optics laser cutting machine. It is designed to offer high dynamics during high speed cutting of thin materials while having all the technology and know-how on board to produce stable and consistent parts in thicker material. The machine can cut the sheets on two different height levels inside the machine, this allow the automatic shuttle table system to change very fast between tables since the tables do not need to make any vertical movement. 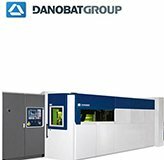 The DANOBAT laser cutting machine is based on fiber technology. This technology greatly minimizes production costs by reducing energy consumption. It also drastically reduces fixed maintenance costs and the cost of consumables. These machines are highly flexible and easy to automate using storage, loading and unloading systems. Fast cutting and piercing speeds thanks to the high-density beam generated by this solid-state laser. High cutting and positioning accelerations thanks to machine cinematics based on linear motors. Simple, compact layout. The use of optical fiber simplifies the machine architecture, as the beam is conducted via a cable.